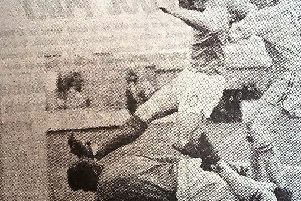 Hartlepool in action in the 1950s. A trip to Carlisle on February 15, 1958, brought Pools a hard-won victory, their first since New Year’s Day. Fans and players had been in the depths of despair before the rain-drenched away match, with lacklustre sportsmanship blamed for the poor run. But the Mail’s sporting pundit Sentinel was delighted to herald a new era following the 2-1 win, after Pools triumphed with “quality” football. “Hartlepools didn’t get the tag ‘United’ for nothing, and they jolly well earned it during the game at Brunton Park,” he wrote. “They scored what to me was their best success of the season, for this was the game in which everything was against them. It was a hard-fought match and a hard-won victory. Pools produced a quality of football which was far and above that seen in recent weeks. Their polish won them victory. Sentinel, sports pundit for the Mail. Heavy rain threatened to make the match a wash-out at the start, but, within minutes, both teams settled in to produce entertaining football. Pools looked the most impressive, however, and took the lead after 16 minutes, when Ken Johnson netted a well-taken goal. “Much interest centred on Johnson in this match, for the 26-year-old forward is reported to be unsettled at the moment,” wrote Sentinel. “Scouts from at least two league clubs were expected to watch his performance at Carlisle and must have left with a favourable impression. Pools continued to dominate the first half, though centre-forward Peter Thompson was given little scope for scoring by the close marking of Carlisle. The second half brought a tough tussle for the rearguard too, for Carlisle staged a tremendous fight back in the face of defeat. It proved a see-saw struggle, with the thrills not just confined to one quarter. Pools, however, held their lead until 17 minutes from the end. “Ackerman scrambled the ball home, with Pools appealing for hands against the home leader, but the referee would hear none of their protests,” wrote Sentinel. “But Carlisle were on level terms for only five minutes for, in the 78th minute, Rayment, never suited to the heavy going, netted a surprise goal. “Crossing from the right wing, he saw the ball beat goalkeeper Thompson and cannon gently off the far post into the net. With just 12 minutes to go, there was little doubt in the minds of fans that Thompson’s goal would be the match-winner. Indeed, Carlisle’s effort appeared to be spent, and they failed to summon a reply. “Pools were without a win since New Year’s Day when they arrived in Carlisle and knew they badly needed points to hold their league position,” wrote Sentinel. “There was a strong incentive for Carlisle to do well as well, for a win could have taken them back to the top half of the northern section. “In the event, it was a hard-fought match and a hard-won victory.